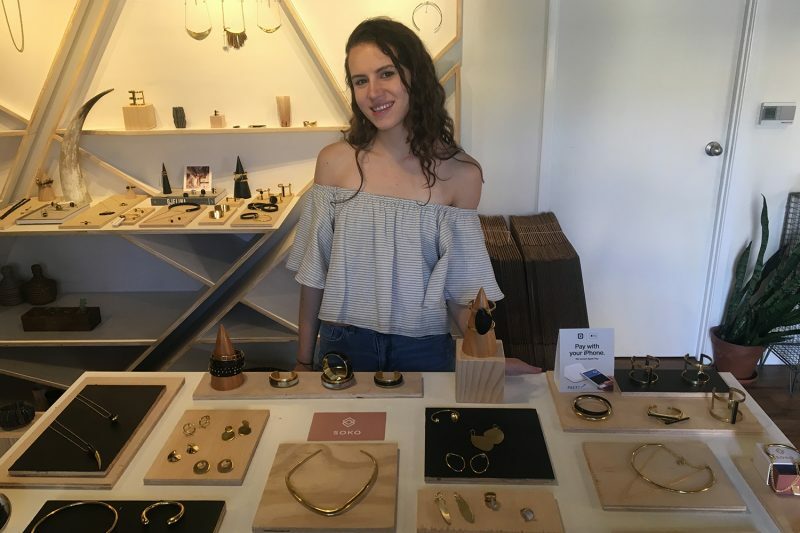 Small Company, Big Internship Marta Regn ’19 used her internship to throughly explore all aspects of a sustainable, ethical jewelry startup. Marta Regn ’19 at the jewelry company Soko, where she interned over the summer. I interned with Soko, a sustainable, ethical jewelry startup. Soko uses existing artisan networks in Kenya and connects these people to Western markets through technology. The business model is built around artisans keeping around 30 percent of the profits, which is revolutionary in the fashion industry where workers’ wages and conditions are compromised to keep the cost of fast fashion low. Using materials such as reclaimed brass, as well as horn and bone (natural byproducts of Kenya’s meat industry), Soko gives new life to unused materials, with little to no environmental impact. And on top of all that, the jewelry is gorgeous and affordable. My role at Soko was on the operational side, working closely with the sales and merchandising departments. I helped fulfill orders, manage inventory, as well as merchandise trade shows and pop ups. Q: What was your favorite aspect of your summer away? I worked at Soko’s headquarters in San Francisco. The diversity of cultures and rich history, set in the natural beauty of northern California made SF an otherworldly place. I loved the food and the music scene, but my favorite part was, for sure, the local boutiques and vintage stores. The city has style, no doubt about it. Q: What was the most rewarding and fulfilling part of your internship? Working with a smaller company in a startup environment provided me a wider range of experience than a typical internship program. While my internship is formally in sales, I got to meet and work with individuals from every branch of the company. It allowed me great networking experience, as well as the opportunity to really test the waters of the business and fashion fields and figure out what I’m interested in. My biggest challenge during my internship is something I’ve been working on throughout my college career. I’m not especially assertive, and I’m often introverted in new settings, so joining a new company, asking questions, and meeting new people required me to leave my social comfort zone. I can definitely say that this experience provided me with a lot more confidence, and I’m excited to use these networking skills in the near future. Even though we hear it all the time, having a liberal arts education has really given me a unique perspective. I think many people can get tunnel vision in analytical fields, which business certainly is in part, but W&L’s well-rounded curriculum has ingrained the ability to keep in mind the big picture, make outside connections, and put all of those numbers in context. Living on your own in new places and experiencing that everyday independence simply cannot be taught in a classroom. I can honestly say I am more self-sufficient and confident in my abilities than I was before going to San Francisco. I could not have had this experience without the support of the entrepreneurship internship program, as well as the Johnson Opportunity Grant. I am so grateful.